William Dobbie was brought up in the East End of Glasgow, one of two children. His artistic abilities were recognised during his school years where he won gold and silver medals for art. He graduated from Glasgow School of Art in 1977. Since then he has built his reputation at home and abroad. His work hangs in private collections in America, Australia, and the United Arab Emirates, as well as throughout the British Isles. Commissions have been undertaken for major companies, national charities and one of Scotland's leading advertising agencies. 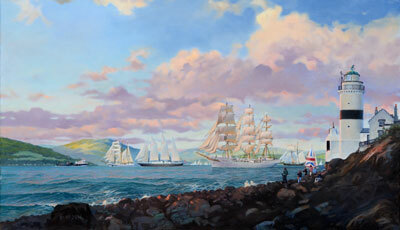 He was official artist to the Tall Ships visit to Greenock in 1999. Click any image for an enlargement and full details.